Vallourec is the world leader in premium tubular solutions primarily serving the energy markets, as well as other industrial applications. 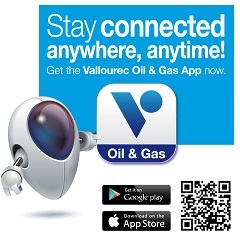 With 24,000 employees, integrated manufacturing facilities, advanced R&D, and a presence in more than 20 countries, Vallourec offers its customers innovative global solutions to meet the growing energy challenges of the 21st century. Vallourec’s sales operations guarantee the worldwide supply of global solutions and services tailored to the local needs of its customers. This local presence is strengthened by a network of more than 160 VAM® licensees and VAM® Field Services teams. NSSMC (Nippon Steel & Sumitomo Metal Corporation, former Sumitomo Metal Industries merged with Nippon Steel in 2012) is the world-leading integrated steel producer, annually producing over 45 million tons of crude steel, 1 million tons of seamless pipe including OCTG carbon and CRA and 1.5 million tons of welded pipe. Together with worldwide sales-force and service network, NSSMC has built a high reputation of quality and innovation as a producer of critical application tubular used across various industries. In 1984, a joint venture among Vallourec (51%), former Sumitomo Metal Industries (34%) and Sumitomo Corp (15%) was established and named VAM USA for the development and sales of premium connections in the world. In 2009 Vallourec and Sumitomo strengthened their long standing collaboration in the field of premium connections through the merger in the USA of VAM USA, with Atlas Bradford®, then owned by Vallourec to form VAM USA, LLC. As oil and gas wells go deeper with ever higher pressures, temperatures and more corrosive conditions, requirements for tubulars are increasingly severe. Our parent companies offer a premium tubular product to fit any well condition and develop the OCTG of the future.